What is the World of Warcraft game? World of Warcraft (WoW) is a massively multiplayer online role-playing game (MMORPG) released in 2004 by Blizzard Entertainment. It is the fourth released game set in the Warcraft fantasy universe. World of Warcraft has had seven major expansion packs released for it: The Burning Crusade, Wrath of the Lich King, Cataclysm, Mists of Pandaria, Warlords of Draenor, Legion, and Battle for Azeroth. When talked about MMORPG, World of Warcraft must be the most discussed game always. WoW isn't the first game in its kind, but it's the most successful one in history, Blizzard developed it for seven years before publish. Player control their character in the 3D world to explore the landscape on Azeroth with opposite factions and races. NPCs can be killed by foes players, and battles happens everywhere in wild districts in this PvP oriented online game. World of Warcraft is set in the same universe as the Warcraft series of real-time strategy games and has a similar graphics and shared elements. While players can do quests and level up individually, they can also team up with others to tackle more challenging content. Different races and factions’ characters spawn in different area, and even continental, and there is multiple quest lines spread all over the world. Why Buy World of Warcraft US Gold from Joymmo.com? We started business on WOW GOLD since 2004. Until now, we served more than 300,000 satisfied customers who place nearly 2,500,000 orders with us each month. 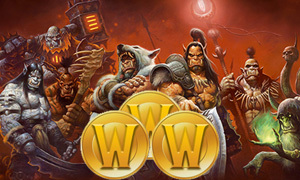 Buy cheapest World of Warcraft US Gold with the elder player together now!